Matunga is a locality in the heart of Mumbai City towards downtown Mumbai. It is serviced by the Matunga Road station on the Western line, Matunga on the Central Line and King's Circle station on the Harbour Line. 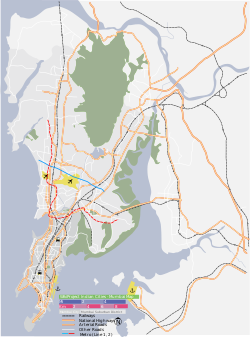 Geographically, Matunga is surrounded by the Sion-Dharavi belt to the North, Mahim to the North-West, GTB Nagar to the North-East, Wadala to the East and Dadar to the South. Matunga formed a part of the seven original islands of Mumbai with Mahim, then known as Mahikavati. It is said that the King of Mahikavati had his elephant stables in Matunga, and that the name Matunga was derived from "Matanga", the Sanskrit word for Elephant. Matunga was among the first well planned localities of Mumbai. The Dadar-Matunga-Wadala-Sion plan of 1899-1900 was formulated to evenly distribute population as well as provide better living standards. Matunga has a juxtaposition of Irani cafes and Udupis and houses one of the oldest residents of Mumbai. The Dadar-Matunga-Wadala-Sion scheme of 1899-1900 was the first planned suburban scheme in Bombay. The City Improvement Trust formulated this plan in order to relieve congestion in the centre of the town, following the plague epidemics of the 1890's. According to the survey plan, 60,000 people were to be housed at Dadar-Matunga and an equal number in Sion-Matunga. 85,000 people were to be accommodated in the developments in Sewri-Wadala. The plans regulated constructions with emphasis on proper sanitation. No building was to be more than three storeys high, and the buildings were to have open spaces between them. The land-use was planned to be a mix of residential, commercial and institutional constructions. Parks and gardens were planned, and the streets were well laid out. 440 acres of land was procured and leased to the Government for selling. For the first time housing cooperatives were formed to take advantage of newly developed land. The Parsi and Hindu colonies in Dadar and the Tamil colony in Matunga were developed in this way. Among the institutions which moved here according to the CIT plan were the VJTI and King George's School. Matunga has a large population of South Indians especially, Tamil Brahmins, who have been residing here for several decades. An effect of this has been a good number of traditional south Indian temples and restaurants serving authentic South Indian dishes that can be found in the area. The number of Gujaratis has also been on the rise in recent years. One of the earliest Gujaratis to come to Matunga were from the Kapol community. They built the Kapol Hostel and Kapol Niwas in Matunga. Matunga, having a predominantly Hindu population, also has a sizeable presence of Maharashtrians, Bengalis and members of the Parsi community. Matunga has numerous temples, namely, the Astika Samajam, the South Indian Bhajan Samaj, Sri Sankara Matham, Sri Kanyaka Parmeshwari Temple, The Church of Mary, Help of Christians (also known as Don Bosco Church), the Jain temples in Kings Circle and the Marubai Temple. There is also the Matunga Mosque which is an important place of worship for members of the Muslim community. Matunga houses multiple cultural centres, namely, the Mysore Association , the Gujrarati Seva Mandal and the Karnataka Sangh Hall in Matunga West. The Shanmukhananda Auditorium, a major cultural centre lies on the border of Matunga and Sion. Ganesh Chaturthi is celebrated on a large scale in Matunga, with multiple Ganesh Mandals that are beautifully decorated during the 10 day festival. The Lal Bahadur Shastri Market in Matunga is the main market of Matunga, housing multiple shops and hawkers selling vegetables, clothes, jewellery and groceries. Matunga East does not house either a meat market or a fish market and the nearest shops for poultry and fish are in Matunga West, Wadala and Dadar. The flower market of Matunga is famous for its South Indian essence and is quite well known in Mumbai. Matunga also houses some famous convenience stores such as Chheda Stores and Gupta's. Giri Stores and Madras Concerns are some of the famous South Indian shops in Matunga. Matunga houses the Veermata Jijabai Technological Institute (VJTI), Institute of Chemical Technology (erstwhile University Department of Chemical Technology), Guru Nanak Khalsa College, R.A. Podar College, South Indian Education Society's School, Ramnarain Ruia College and Wellingkar Institute of Management are some of higher education institutions located in Matunga, which are accredited by the National Assessment and Accreditation Council (NAAC). Some of the other schools nearby are J.B.Vacha School in Dadar Parsi Colony and King George School nearby in Dadar, which are on the border of Matunga and Dadar. In 1937, the general council of Salesians of Don Bosco approved a plan to buy 60,000 square yards (50,000 m2) land in Matunga from the Bombay Municipal Corporation. The Corporation approved the sale on 16 July 1937. The Salesians bought the land for Rs. 229,160. The Don Bosco High School (formerly known as The Catholic Educational Institute) run by them was shifted from the rented premises at Tardeo to the new Don Bosco campus at Matunga. Mumbai's first engineering college, Victoria Jubilee Technological Institute (VJTI) was founded in 1887. It was later renamed Veermata Jijabai Technological Institute. Matunga is known to produce multiple sportspeople who have represented Mumbai and even India. The Matunga Gymkhana and associated ground is a home for budding cricketers. Similarly, Matunga Gymkhana has facilities for Tennis, Squash, Swimming and Badminton. Indian Gymkhana in Matunga is a preferred venue for Cricket and Basketball training. The Don Bosco School has multiple facilities for Football, Cricket and Basketball. ^ "Pincode of Matunga". pincode.org.in. Retrieved 5 February 2014. ^ "Matunga". Matunga. Retrieved 15 July 2018. ^ "What is the history behind naming the stations in Mumbai? - Quora". www.quora.com. Retrieved 15 July 2018. ^ "Dadar, Matunga, Wadala, Sion: Mumbai/Bombay pages". Tata Institute of Fundamental Research. Retrieved 19 August 2013. ^ 1-619-595-0139, Global Energy Network Institute. "The history of Dadar, Matunga, Wadala, Sion: Mumbai/Bombay, India over the last 500 years - Interesting Links That Relate to GENI - Technical Articles - Index - Library - GENI - Global Energy Network Institute". www.geni.org. Retrieved 15 July 2018. ^ "Asthika Samaj,Kochu Guruvayoor, Sree Ram Mandir,Matunga". www.asthikasamajmatunga.com. Retrieved 15 July 2018. ^ Thakker, Darshita. "8 Places Of Worship In Matunga: Temples And Beyond". Culture Trip. Retrieved 15 July 2018. ^ "Google Maps". Google Maps. Retrieved 15 July 2018. ^ "The Mysore Association, Bombay". www.mysoreassociation.in. Retrieved 15 July 2018. ^ ":: Home ::". www.shanmukhananda.com. Retrieved 15 July 2018. ^ "Guru Nanak Khalsa College". Guru Nanak Khalsa College. Retrieved 5 February 2015. ^ "History of Don Bosco High School". Don Bosco High School Matunga. Retrieved 19 August 2013. ^ "Director's Report, Convocation, 14 March 2006". VJTI. Archived from the original on 20 August 2011. Retrieved 19 August 2013.